One of the biggest challenges with older pools is maintaining the proper concentration of chlorine necessary to keep the clean and healthy. Traditional chlorine systems use a combination of chlorine tablets and liquid chlorine. When the tablets are first placed in the pool (typically in some sort of floating device), the chlorine level is too high. Once the tablets have disolved, the chlorine level is too low. If the pool has a low chlorine level for too long, algae will start to grow, which is what forces the need to "shock" the pool with liquid chlorine. A high concentration of chlorine burns the eyes, which is why pools can’t be used right after they are shocked. This roller coaster in the level of chlorine is a common issue for older backyard pools. Fortunately, there are now systems that eliminate the chlorine roller coaster. They are known as saltwater swimming pool systems. They work through the addition of a generator to the pool filtration system. You add bags of salt to the system. The salt flows through the generator, and the generator turns the salt into chlorine. 1) Healthier pool. One big advantage of this is that you control the chlorine level electronically. You set the level and the system will maintain that amount of chlorine in the pool. This keeps the pool and those who swim in it healthier. 2) Automatic adjustments. Salt systems cope well we changing conditions. If you get a lot of rain or have a large groups of people using the pool, this typically requires additional chlorine. This is no problem for a saltwater swimming pool system as it automatically adjusts for the changing chlorine needs. For most salt water pools, the only chlorine maintenance needed is a few bags of salt poured into the system once or twice a year. 3) Lower cost. The salt needed for the salt system is much less expensive than chlorine tablets and liquid chlorine. A salt system usually pays for itself within 2-3 years. 4) Save time and effort. 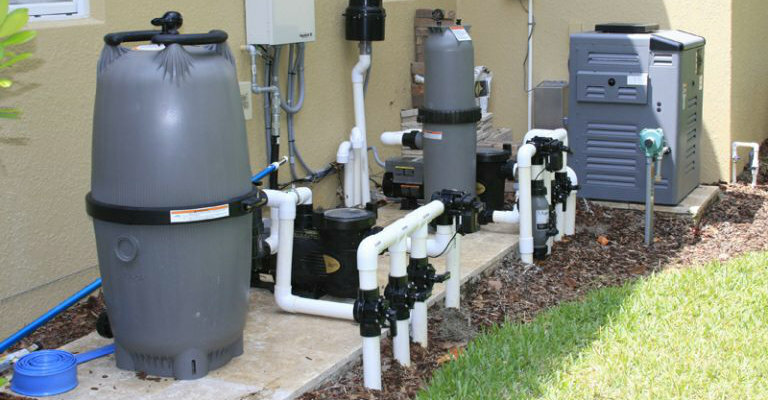 With a salt system, there are no more monthly trips to the pool store to refill liquid chlorine jugs. No more weekly shocking the pool and refilling the tablet container. All you have to do is pour a bag of salt into the system every few months. 5) Safety. Chlorine is a dangerous chemical. Breathing chlorine fumes can cause health problems. Having liquid chlorine and chlorine tablets around the house where young children could get into them could be tragic. With a salt system, these dangers are eliminated. 6) No bleaching. Liquid chlorine has a tendency to spill and bleach things. This can ruin the material in the back of a vehicle when it's being transported from the pool store. It can ruin clothing as drops of liquid chlorine splash while being poured into the pool. To upgrade to a saltwater swimming pool, contact us at Grand Vista Pools today!